No Bugs! offers a revolutionary approach to software development by showing programmers how to write error-free code from the start. No Bugs! presents techniques to stop many kinds of bugs from being included in a prog ram. 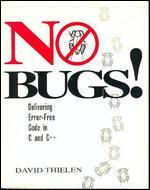 It also discusses how to test programs to find bugs. Experienced software developer David Thielen reveals a series of tricks that you can include in a program to warn of the presence of bugs. All are designed to be quick and easy to implement so that you can shorten the amount of time needed to complete and test your programs. All coding is done in C, C++, and assembly language, and all examples are fully functional. No Bugs! also explores effective testing strategies, demonstrating the importance of a carefully thought out testing process in shipping bug-free software. More than a debugging guide No Bugs! offers programmers a new way of thinking about developing software. It is also an invaluable resource for testers, managers, software support personnel, and anyone involved in ensuring that software is delivered bug free to the customer.